I visited the bridge of NOAA Ship Henry B. Bigelow to see how the ship is run. 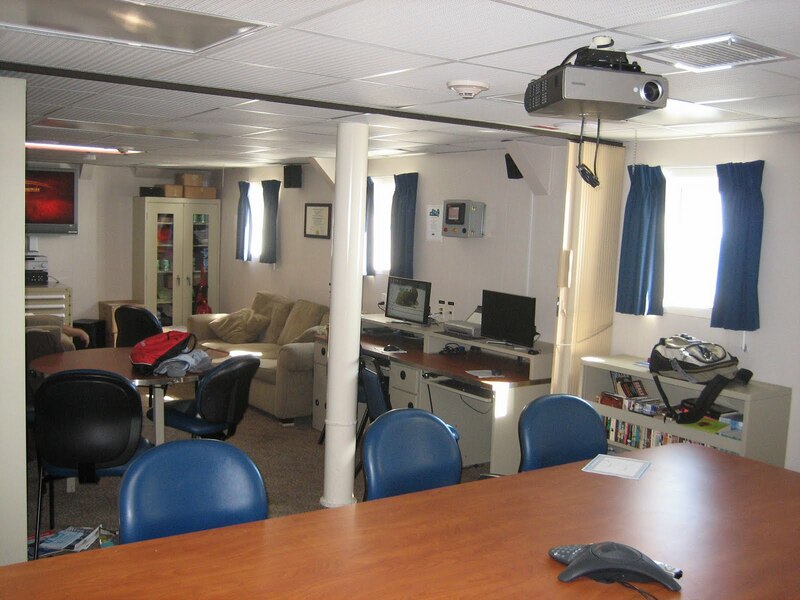 Thebridge sits atop the ship and is the command center for all navigation andcommunications operations during the cruises. Windows surround the entire bridge, giving NOAA Corps officers a 360 degree view of the surrounding ocean. 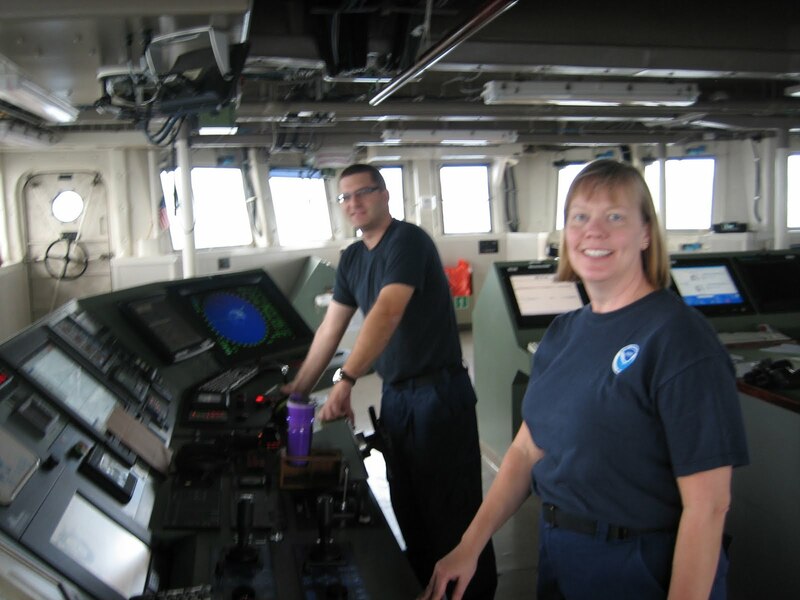 Here, Commanding Officer, Anne Lynch, and Junior Officer, ENS Kyle Sanders stand at the main bridge console of the ship. NOAA Corps officers chart the ship’s course, control the speed, steer the ship, detect other objects in the ocean via sonar, monitor weather conditions, and communicate with others at sea, on the ship, and on shore from this console. 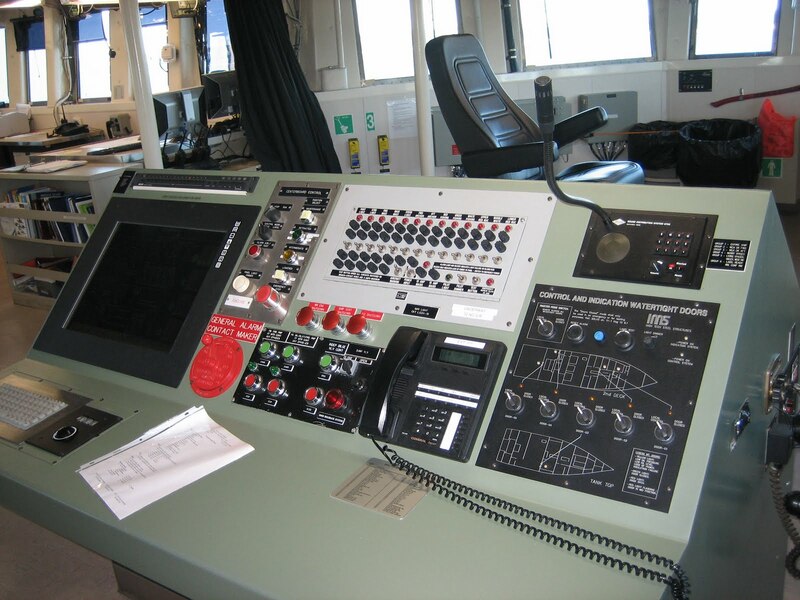 The Aft Control Station (ACS) is located at the rear of the bridge and overlooks the working deck. 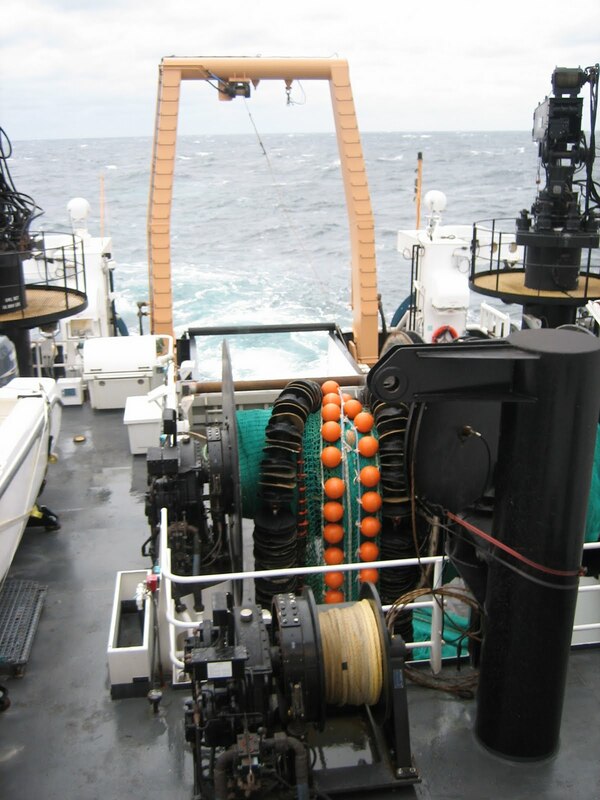 The ACS provides control ofthe Auto Trawl System to pull the research net at a constant andstraight trawl. A closed circuit television improves the crew’s visibility while operating the gear from the bridge. Here is a picture of the ACS control panel on the bridge and the research net on the rear deck. Henry B. Bigelow is also equipped with two scientific SONAR systems used for gathering data on fish and plankton and for collecting oceanographic data, such as water salinity and water temperature. Transducers are mounted at the center of the hull and extend below the ship to take acoustic readings of water depth or the location of schools of fish. One of the SONAR transducers on this ship can work at depths as deep as 5000 meters and can detect objects under water as close as one meter or as far away as 800 meters. 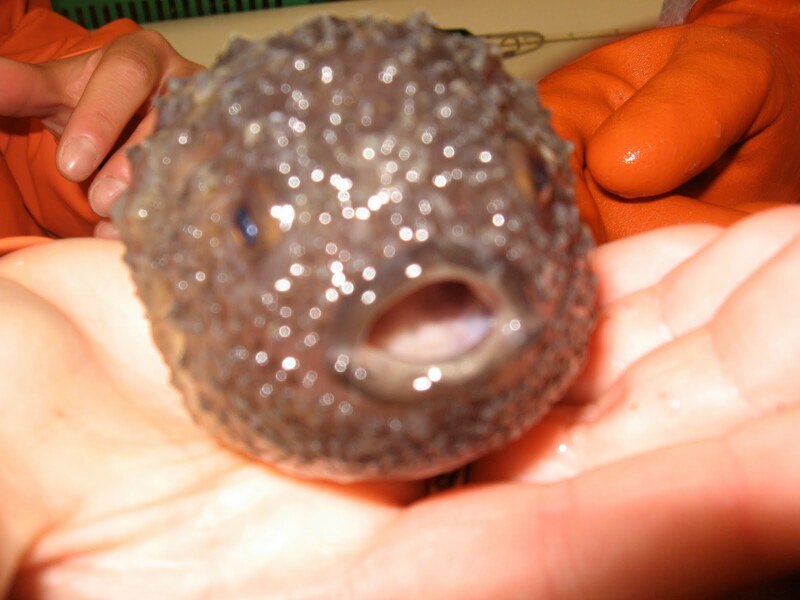 It also detects objects on the sea floor, as well as in the water column. This system is controlled from the bridge, as well. 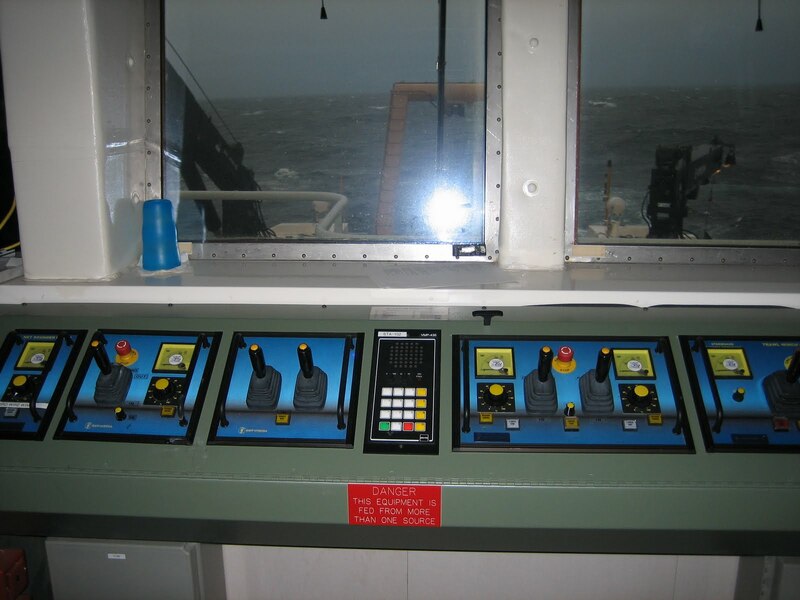 A separate control panel is used to monitor and control power and water usage on board the ship. Two generators provide electricity for the ship. There are also tanks in the hull designated for different purposes, such as holding water, fuel, and potable water. This control board monitors all of the tank and power usage levels for the entire ship. Today is my birthday! 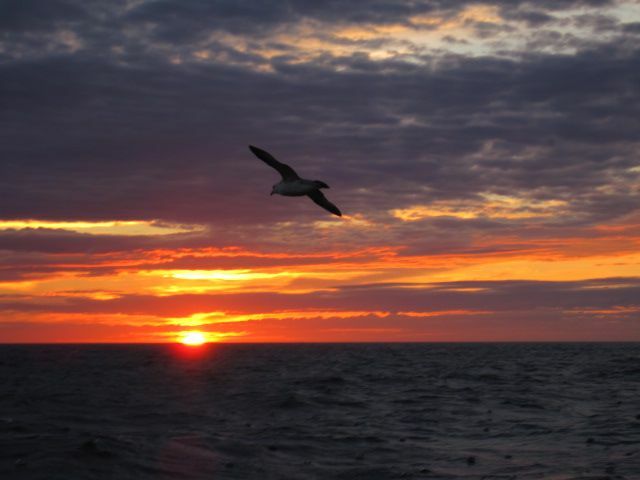 Spending my birthday aboard a NOAA research vessel is a great gift! Today is also the second day spent waiting for the seas to calm down so we can take more samples. Wind speeds are 34.25 kts. and the waves are about 11-16 feet high. The boat is rocking and rolling, and makes it very difficult to move around. The night watch is sleeping, so we cannot go in our staterooms, and we must be quiet everywhere we go. It is too windy to go outside on the deck, as well. The only thing we can do is wait in the lounge. The lounge is equipped with a television, two computers, couches, a conference table, games, movies, and reading material. Since it is my birthday, I have the honor of selecting one of the movies we will watch. That’s a hard thing to do when you are with a group of people with so many different tastes and personalities. . . the “A Team” it is! It’s great that the crew and scientists have a place to go for entertainment, because waiting for so many hours on end can start to get on everyone’s nerves. 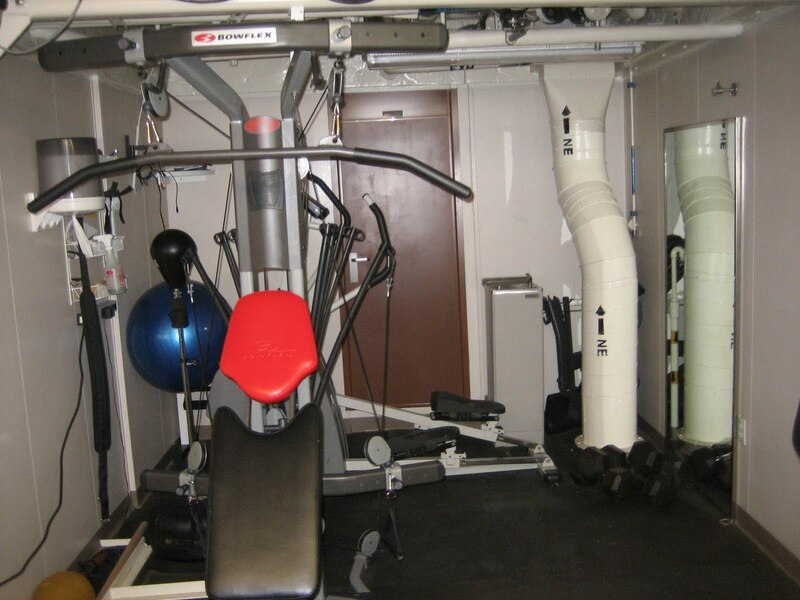 Luckily, the ship also has a workout room, which I visited briefly. It’s very difficult to lift weights when the ship is rocking, and the elliptical machine seemed to run by itself. The stationary bicycle was a little easier to manage, and it felt good to move my legs after sitting for so long in the lounge. 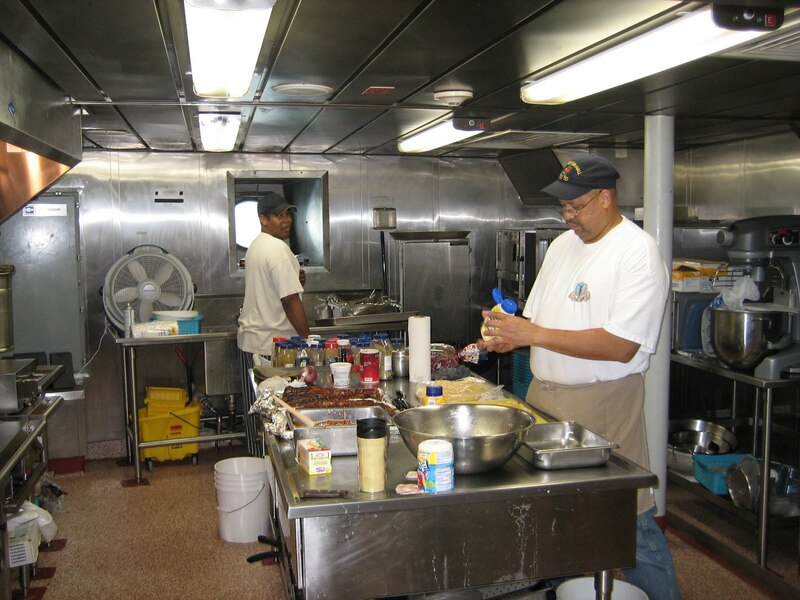 However, I think the biggest morale booster for me, the crew and the scientists is thewonderful food that Dennis and Randy make in the galley. Their menus rival those of some finer restaurants I’ve visited, and we are treated to their artistry every day way out here in the ocean. I’ve truly been spoiled! You have officially been challenged! After my shift ends at 1600, I usually hit up one of the gyms. That’s right, I said gyms – plural. There is a forward gym that contains a treadmill, an exercise bike and an elliptical and an aft gym, located in the winch room, which contains a treadmill, an ERG machine, a spin bike and free weights. Abby, Katie, Michele and I usually hit up the gym at about the same time and have a great time comparing our ability to not do ring push-ups while we rock out to music.Workout time is a way for us to zone out for a while even though we have to stay focused on our movements when the swells are high (see weather entry for more information). I’ve tried using the treadmill a couple times and feel like I’m getting twice the workout because I have to use my core and arms to keep me steady.Since the gym is a popular place for many residents of the Oscar Dyson, Ensign Amber Payne spearheaded a “European Challenge of the Century.” While we travel our transects on the Bering Sea, officers, crew and scientists are tasked to climb the Matterhorn (lower body workout), bike the Tour de France (exercise or spin bike), swim the English Channel (there is a pool in Dutch Harbor), hang-glide across Ireland (ab workouts), and more. We were assigned teams randomly and have the opportunity to contribute while we are at sea. 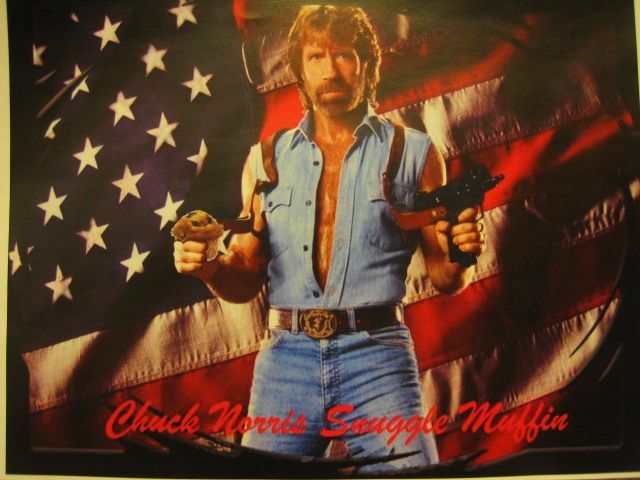 My team, Chuck Norris Snuggle Muffin, has taken an early lead but other teams are getting into the spirit and the gyms have been more crowded recently. The competition will last until the end of the field season (early October) but I am excited to contribute while I can. In addition to the gyms, people who are off duty congregate in the computer rooms or the lounge. Everyone on the ship has some quantity of work to do on the computer and email/messenger is the most reliable method of communication to family and friends off the boat (even though the Internet is less than reliable as we go farther north). We are lucky to have comfortable couches, a big screen TV and a collection of hundreds of movies, including several recent movies. Recently, a large group of us day shifters watched the classic Enter the Dragon and periodically imitate Bruce Lee as we launch XBTs and process pollock.